The most common type of bankruptcy in NH is a chapter 7, where the typical debtor is able to keep all of his or her assets, and discharge all of their debts. A discharge order is a court order releasing a debtor from all of his or her dischargeable debts and ordering the creditors not to attempt to collect them from the debtor. A debt that is discharged is one the debtor is released from and does not have to pay. Some debts, such as most tax debts and student loan debts, are not released by a chapter 7 discharge. In addition, if you wish to retain your home or car, you still need to make your regular monthly payments to these secured creditors following the chapter 7 bankruptcy. 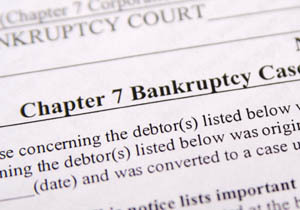 The filing of a chapter 7 bankruptcy is best for those whose personal debt has become unmanageable. The entire process from filing to resolution can take between four to five months. The filing of a chapter 7 case automatically stays most lawsuits that have been filed against a debtor. Shortly after the chapter 7 case is filed, the court will notify all creditors to refrain from any further collection action against a debtor. Any creditor who intentionally violates this court order may be liable to the debtor for damages. It is illegal for either private or government employers to discriminate against a person as to employment because that person has filed under chapter 7. It is also illegal for local, state, or federal government units to discriminate against a person as to the granting of licenses (including a driver’s license), permits and similar grants because that person has filed under chapter 7. There are certain situations when a debtor should consider filing a chapter 13 bankruptcy rather than a chapter 7 bankruptcy. Chapter 13 is usually preferable for the debtor who (1) is behind with their mortgage payments and the bank will not work with the debtor so they may become current with their mortgage, (2) has valuable nonexempt property pledged as security for debts, which they would lose if they filed under chapter 7, (3) is not eligible for a discharge under chapter 7, (4) has one or more substantial debts that are not dischargeable under chapter 7, or (5) has sufficient assets with which to repay their debts, but needs temporary relief from their creditors in order to do so. While overwhelming debt takes an immeasurable emotional and physical toll on individuals and their families, a chapter 7 bankruptcy may provide the break in the cycle of ever- growing debt, and provide you with the chance to start again. The prospect of eviction and foreclosure and the daily calls from creditors can cause fear, stress and anxiety. The more quickly you investigate your options and meet with a professional to learn the facts about bankruptcy, the more quickly you can be on the road to financial recovery.